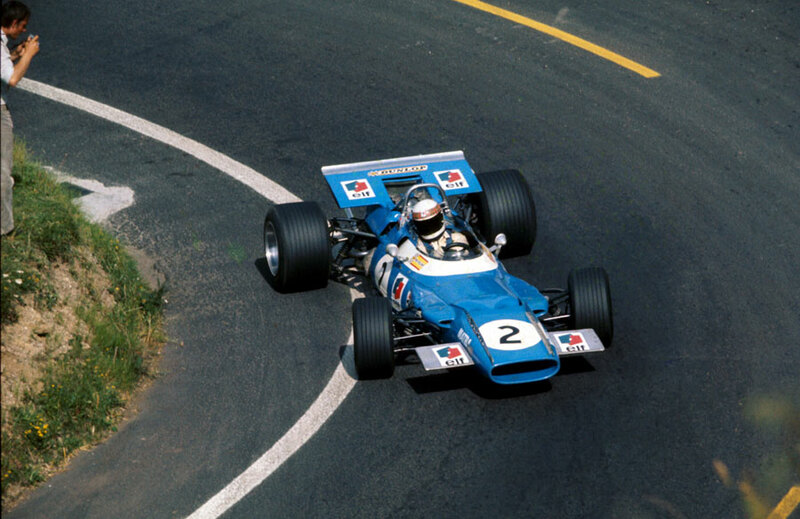 Jackie Stewart's inexorable progression to his first world title continued with victory at the French Grand Prix, his fourth win in five races and a result which opened up a 16-point lead over Graham Hill in the drivers' championship. It was also the race where the tradition of the winner spraying champagne started. The peripatetic race returned to the Charade circuit at Clermont Ferrand - a windy course with 51 bends and a climb of 600 feet. It attracted the smallest starting grid in the history of Formula One - just 13 cars. They included three Team Lotus entries because Colin Chapman had decided to give Formula Three ace John Miles a chance in the new four-wheel drive Lotus 63. Jack Brabham was absent because of a broken ankle and so too were BRM. Stewart again dominated the weekend, taking pole and then completing a flag-to-flag win under clear blue skies, shattering Jim Clark's lap record four times for good measure. The drama came behind him. Denny Hulme initially gave chase before he was forced into a lengthy pit stop after a bolt broke on his front roll bar, and then Jochen Rindt, who was suffering from such bad nausea he was using an open crash helmet, retired. The announcement to the crowd was that he had "serious mechanical trouble" but the real reasons were physical. Jacky Ickx, fresh from his victory in the Le Mans 24-Hours, and Jean-Pierre Beltoise then slugged it out for second for almost an hour, racing within touching distance of each other for much of the time. Ickx started the final lap ahead, but as they came round the last bend Beltoise was 40 feet in front, holding off a late dash from Ickx to finish a car length ahead. Hill, clearly in trouble, was lapped by Stewart and gradually slipped back down the field while Vic Elford, now in Colin Crabbe's private McLaren, came fifth just behind Bruce McLaren himself. As Stewart celebrated, someone passed him a bottle of champagne. "I was surprised but I thought the least I could do was open it," he said. "Nobody had told me it had been in the sun and so as I released the cork the champagne foamed out. I thought it would be a shame to waste any, so I put my thumb over the top, but this only increased the pressure and produced a powerful jet. Everyone was enjoying it, so thinking I might as well have some fun, I started spinning round and spraying champagne in every direction."